Our dynamic PD and training sessions are a bit different. We believe the best way to engage with STEAM & Maker Ed is to embrace the creative process with inspiring yet concrete experiences that mirror classroom environments. So our sessions are grounded in immersive, hands-on curricula and project training to model how making ignites engagement, inquiry, creativity and problem-solving. We work collaboratively with formal and informal educators to customize workshops to meet our partners' goals. Live and web-based sessions include tons of creative making, deep discussion, real-world implementation strategies and many instructional tools & resources. And our Immersive PD pairs dynamic training with exciting student workshops to model programs real-time. Teachers are truly our heroes and we adore working with fellow educators! Our innovative and unconventional Professional Learning experiences are great for formal and informal educators interested in STEAM practice and Maker education. Whether you're a school, museum, library or non-profit organization, our immersive workshops investigate how creativity and making can transform equitable leading and learning. Sessions always pair fruitful dialog with tons of hands-on creating to explore our many exciting Eurekus programs. We strive to deliver meaningful curricula, exciting projects and well-designed resources for easy implementation. We also design our programs to have both the rigor and flexibility to adapt to individual classroom goals. From dynamic lessons and projects to Maker Space instruction, get all the tools you need to take exciting practice back to your creative communities. As curriculum developers for NASA and McREL International, we have trained thousands of teachers from all backgrounds on our exciting NASA programs. We've developed an innovative suite of FREE curricula and projects which transform space science and engineering discovery through creativity and the making process. During hands-on immersion, our NASA STEAM experiences galvanize learning and leading in new and dynamic ways. Enjoy investigating planetary science, astronomy and cultural sky stories through 2D and mixed-media works. You'll also explore Maker education with a set of engineering projects which build in complexity, igniting "engineering literacy" and design thinking. During our workshops, you'll receive training on fun projects and activities, tips for practical STEAM practice and many valuable teaching resources to foster curiosity - in yourself and others. 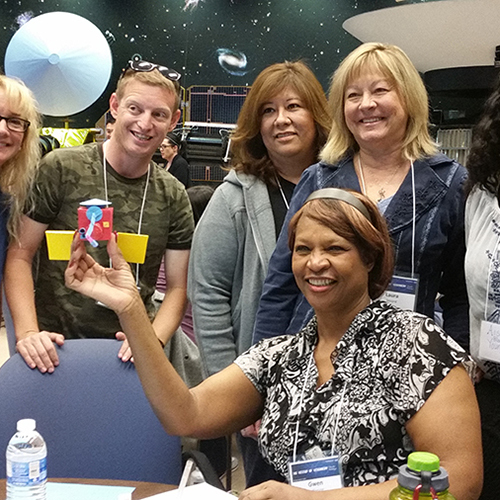 Denver educators have a blast with our Simple Machines Shoebox Rover during NASA's STEAM experience at Think 360 Arts.